I firmly believe that the best way for young children to learn music is through free, hands-on self-directed play. Formal music lessons can be wonderful for older children but for young children nothing beats exploration and free play. 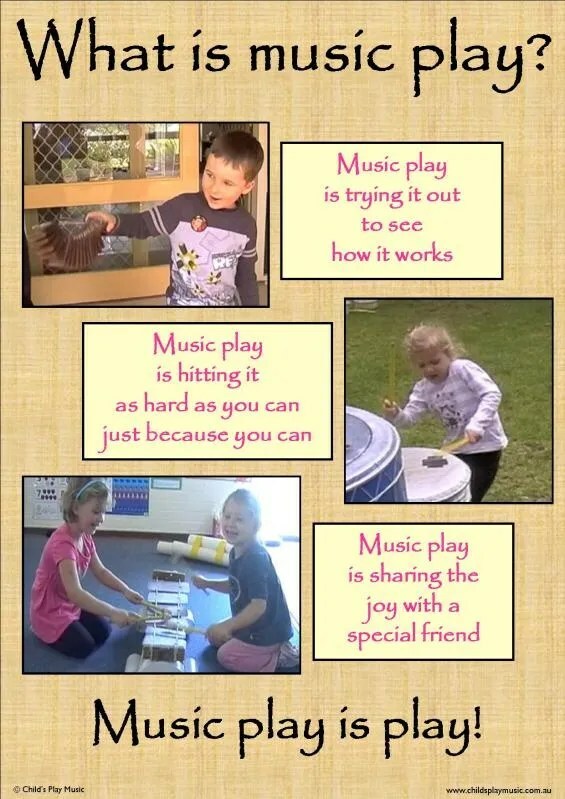 I made this poster about music play and I think it explains my beliefs about young children and music very well. It got quite a few shares on Facebook and it seems to have struck a chord with people. Play is the fundamental way that children learn and make sense of their world, and music play is simply one of the many forms of play. But what is “play”? Play is “what children and young people do when they follow their own ideas and interests, in their own way, and for their own reasons.” PDF link. Or to put it another way, “play is what children do when adults aren’t telling them what to do”. The more rules adults impose and the more they direct children’s play the less play-like it becomes, the less fun it becomes, and the less children learn. So let the children take ownership of their music play; give children plenty of time and space for exploration and keep the rules to a minimum. When children are given freedom to explore they come up with far more creative ideas than when they are instructed or told how to play. Music play is often exuberant, noisy, chaotic and apparently random. That’s good! Music play is also often quiet, introspective, exploratory and focused. That’s good too! Sure you can get involved in your children’s music play! Am I saying you shouldn’t get involved in your children’s music play at all? No! Children love to have adults join in their play and you can model ways to play music and extend children’s play through scaffolding. But the children need to be leading the play; I like to think of it as being a participant, a player who is sharing in the play, not a leader who is directing the play. In children’s music play our main role is to provide an environment which supports their play and exploration. I really believe that the best place for music play is outside – check my blog post on PreK + K Sharing for dozens of ideas for creating a vibrant outdoor music play environment, including what instruments work best outside, designing and building music stations and music walls, using playground equipment as music instruments, movement to music, and more. 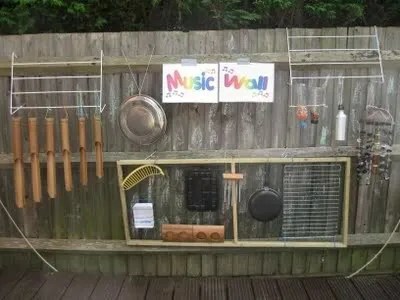 For more images of music walls and outdoor music ideas make sure you check my Pinterest boards. 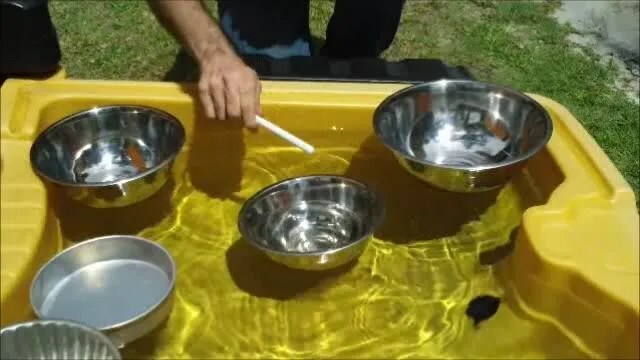 And check my post on music play and water play – fun ways to explore music and the science of music through water play and everyday household materials. This entry was posted in Music play, Outdoor play and tagged Early Childhood, music play, music stations, Play by Alec @ Child's Play Music. Bookmark the permalink. Excellent post, Alec. I support everything you say here. 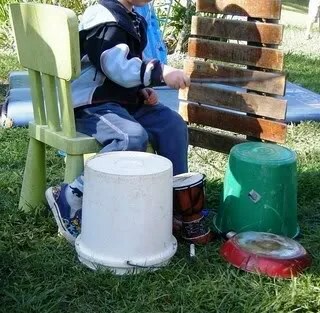 Certainly outdoors is the best venue for free exploration of music, because otherwise it can be very hard on noise-sensitive children (and teachers! LOL). The Powers That Be are often sensitive to the possibility of damage when you take instruments outside, as am I! !- so I always make sure to give children some intentional teaching first to help them care for the instruments appropriately. We talk, for instance, about the sandblocks having paper on them, and do experiments to show what happens to sandpaper when it gets wet; we talk about the drum heads and how they can be punctured. It doesn’t prevent every accident, of course, but it does help to maintain the supply of traditional instruments in environments where money is always tight. What child doesn’t enjoy making a noise! Perfect way to let them enjoy creating their own music.